For the Amorphis album, see The Karelian Isthmus. For other meanings of the name "Karelia", see Karelia (disambiguation). Map of the Karelian Isthmus. Shown are some important towns, the current Finnish-Russian border in the North-West and the pre-Winter War border further South. The Karelian Isthmus (Russian: Карельский перешеек, translit. Karelsky peresheyek; Finnish: Karjalankannas; Swedish: Karelska näset) is the approximately 45–110 km wide stretch of land, situated between the Gulf of Finland and Lake Ladoga in northwestern Russia, to the north of the River Neva (between 61°21’N, 59°46’N and 27°42’E, 31°08’E). Its northwestern boundary is the relatively narrow area between the Bay of Vyborg and Lake Ladoga. If the Karelian Isthmus is defined as the entire territory of present-day Saint Petersburg and Leningrad Oblast to the north of the Neva, the isthmus' area covers about 15,000 km2. The smaller part of the isthmus to the southeast of the old Russia-Finland border is considered historically as Northern Ingria, rather than part of the Karelian Isthmus itself. The rest of the isthmus was historically a part of Finnish Karelia. This was conquered by the Russian Empire during the Great Northern War in 1712 and included within the autonomous Grand Duchy of Finland (1809–1917) of the Russian Empire. When Finland became independent in 1917, the isthmus (except for the territory roughly corresponding to present-day Vsevolozhsky District and some districts of Saint Petersburg) remained Finnish. Finnish Karelia was ceded to the Soviet Union by Finland following the Winter War (1939–1940) and Continuation War (1941–1944). In 1940–1941, during the Interim Peace, most of the ceded territories in the isthmus were included within the Karelo-Finnish SSR. However, since World War II the entire isthmus has been divided between the city of Saint Petersburg (mostly Kurortny District), as well as Priozersky District, Vsevolozhsky District and Vyborgsky District of Leningrad Oblast. According to the 2002 census, the population of the Kurortny District of Saint Petersburg and the parts of Leningrad Oblast situated on the Karelian Isthmus amounts to 539,000. Many Saint Petersburg residents also decamp to the Isthmus during their vacations. The isthmus' terrain has been influenced dramatically by the Weichselian glaciation. Its highest point lies on the Lembolovo Heights moraine at about 205 m (670 ft). There are no mountains on the isthmus, but steep hills occur in some places. The Vuoksi, largest river, runs southeastwards from Lake Saimaa of Finland to Lake Ladoga, dividing the isthmus into two uneven parts. Saimaa Canal opened in 1856 links Lake Saimaa to the Bay of Vyborg. The Karelian Isthmus lies within the ecoregion of Scandinavian and Russian taiga. Geobotanically, it lies at the juncture of the Central European, Eastern European and Northern European floristic provinces of the Circumboreal Region of the Holarctic Kingdom. The isthmus is mostly covered by coniferous forests formed by Scots pine (Pinus sylvestris) and Norway spruce (Picea abies), with numerous lakes (e.g. Lake Sukhodolskoye and Lake Glubokoye) as well as small grass[clarification needed], fen and Sphagnum raised bogs. Forests cover approximately 11.700 km of the isthmus, more than three-fourths of its total square. Swampy areas occupy on average 5.5 percent of the territory. In the large contiguous area along the shore of Lake Ladoga in Vsevolozhsky District, in the southeastern part of the isthmus, bogs occur much more frequently than in other parts. The same was once true of the lowland along the Neva River, which has been drained. The soil is predominantly podsol, which contains massive boulders, especially in the north and northwest, where large granite rocky outcrops occur. Pine forests (with Pinus sylvestris) are the most widespread and occupy 51% of the forested area of the Karelian Isthmus, followed by spruce forests (with Picea abies, 29%) and birch forests (with Betula pendula and B. pubescens, 16%). Stands on more fertile soils and in more favorable locations are occasionally dominated by Norway maple, black alder, grey alder, common aspen, English oak, grey willow, dark-leaved willow, tea-leaved willow, small-leaved lime or European white elm. Common vegetation of various types of pine forests includes heather, crowberry, common juniper, eared willow, lingonberry, water horsetail, bracken, graminoids (i.e. grasses in the wider sense) Avenella flexuosa and Carex globularis, mosses Pleurozium schreberi, Sphagnum angustifolium and S. russowii, and lichens Cladonia spp. Prominent in various spruce forests are wood horsetail, common wood sorrel, bilberry, lingonberry, graminoids Avenella flexuosa, Calamagrostis arundinacea, Carex globularis, and mosses Polytrichum commune and Sphagnum girgensohnii. Prominent vegetation of various birch forests include meadowsweet, common wood sorrel, bilberry and graminoids Calamagrostis arundinacea and C. canescens. 1184 species of wild vascular plants are recorded in the isthmus. See also the List of the vascular plants of the Karelian Isthmus. Red squirrel, moose, red fox, mountain hare and boar (reintroduced) are typical inhabitants of the forests. The climate of the isthmus is moderately continental, with 650–800 mm (25–32 in) average precipitation per year, long snowy winters lasting from November through mid-April and occasionally reaching about -40 °C (-40 F), moderately cool summers and short frost-free period. Compared to other parts of the Leningrad Oblast, the winter here is usually milder due to the moderating influence of the Gulf of Finland, but longer. The city of Vyborg and the town of Priozersk are situated on the northwestern part of the isthmus. The Karelian Isthmus is a popular place for hiking, cycling, skiing (Korobitsyno and Kavgolovo), climbing (near Kuznechnoye), canoeing (Losevo), fishing for consumption (of carp bream, northern pike, roach, European perch, ruffe, burbot and others), mushroom hunting (for porcini, red-capped scaber stalk, birch bolete, velvet bolete, slippery Jack, golden chanterelle, Lactarius resimus, woolly milk-cap, ugly milk-cap, saffron milk-cap, Lactarius rufus, various Russulas and others), berry picking (of bilberry, raspberry, woodland strawberry, cowberry, cranberry, cloudberry, bog bilberry and stone bramble). It is a popular summer resort for Saint Petersburg citizens since the late 19th century, served by trains of Finlyandsky Rail Terminal. The isthmus, especially the land along Saint Petersburg–Vyborg and Saint Petersburg–Priozersk railroads, hosts numerous dachas. A 20–35 km wide stretch of land in Vyborgsky District and Republic of Karelia to the west of the Vyborg–Hiitola railway, as well as the islands and shores of the Gulf of Vyborg, belongs to the strictly guarded zone of the border control, reaching the shore of Lake Ladoga at Hiitola. In 1993–2006 the zone was formally 5 km wide, although in fact it has always been much wider. Visiting it is forbidden without a permit issued by the FSB (by KGB during the time of the Soviet Union). Geologically the Karelian Isthmus lies on the southern edge of the Baltic Shield's crystalline bedrock. During the final part of the last Weichselian glaciation, deglaciation in the central parts of the Isthmus started as early as 14000 BP, when it formed the bottom of a large lake dammed by the surrounding ice sheet. During further deglaciation, at the time of the Baltic Ice Lake, an early high water stage of the Baltic Sea, when the ice sheet retreated to Salpausselkä, the upland area of the Isthmus remained a large island and many upland lakes emerged. Prior to 12650 BP, the land was characterized by harsh Arctic conditions with permafrost and sparse vegetation. Steppe-tundra complexes developed after this point. Around 11000 BP climate began to warm and became humid, first pine and birch forests were established. Around 9000 BP Ancylus Lake, another stage of the Baltic Sea, retreated, and many lowland lakes were also isolated in depressions formed earlier by glacial exaration and fluvioglacial activity. Lake Ladoga was separated from the sea as well. Due to land uplift, around 5000 BP the River Vuoksi started emptying into Lake Ladoga as a new outlet of Lake Saimaa. Lake Ladoga transgressed, flooding lowland lakes and the Vuoksi, and became connected with the sea at Heinjoki (now Veshchevo), to the east of present-day Vyborg. Around 3100–2400 BP the Neva River emerged, draining Lake Ladoga into the Baltic Sea. Ladoga level gradually sank from 15–18 m to its modern position of 4–5 m above sea-level, and lowland lakes were isolated again. However, the Vuoksi still had a significant direct outflow connection to the Bay of Vyborg, possibly as late as in the 12th century AD. The connection disappeared due to ongoing land uplift in the 2nd millennium AD. In 1818 a canal, which was dug to drain spring flood waters from Lake Suvanto (now Lake Sukhodolskoye, a 40-km long narrow lake in the eastern part of the Isthmus) into Lake Ladoga, unexpectedly eroded and turned into the Taipaleenjoki (now Burnaya River). The Taipaleenjoki started draining Suvanto and decreased its level by 7 m. Originally waters of Lake Suvanto flowed into the Vuoksi River through a waterway at Kiviniemi (now Losevo), but as a result of the change, the waterway dried out. In 1857 the canal was dug there, but the stream reversed direction, revealed rapids and rendered navigation at Kiviniemi impossible. Since 1857 Suvanto and the Taipaleenjoki have constituted the southern armlet of the Vuoksi River, which has decreased the level of the original northern armlet emptying into Ladoga near Kexholm (now Priozersk) by 4 m, isolating it as a separate river basin. Apart from the old towns of Vyborg and Priozersk, and churches on the Konevets island of Lake Ladoga, since the late 19th century a number of other archaeological sites have been discovered on the isthmus. Numerous archaeological remnants of the Mesolithic, Neolithic, Copper Age and Bronze Age occur all over the isthmus. The eastern part of the Karelian Isthmus hosts a number of medieval remnants. There are many grave pits of Karelians of the 10th–15th centuries with metal and ceramic artifacts along the northern armlet of the Vuoksi, near Lake Sukhodolskoye and in a few other places in Priozersky District. On the southern shore of Lake Sukhodolskoye small medieval burial mounds are abundant as well. A lot of large cult stones have been found along these bodies of water, as well as agglomerations of cairns. Remnants of several rural settlements were also discovered there as well as on the shore of Lake Ladoga. Remnants of the Tiuri (Tiversk) town (10th–15th centuries) were excavated on a former island in the northern Vuoksi armlet near the Tiuri village (now Vasilyevo). A few treasures of silver adornments and medieval Arabian and Western European coins have also been found, as the isthmus laid on the Volga trade route (at that time, the Vuoksi River had a distributary emptying into the Bay of Vyborg). Ancestors of Finnic people wandered to the Karelian Isthmus possibly around 8500BC. During 17th century Sweden gained the whole isthmus and also Ingria. In this time many Karelians escaped to Tver's Karelia. 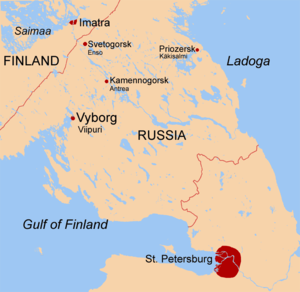 From 1721–1812 the isthmus belonged to the Russian Empire, won in the Great Northern War that started with the Russian conquest of Ingria where the new imperial capital, Saint Petersburg, was founded (1703) in the southern end of the isthmus, in place of old Swedish town Nyenskans. Then in 1812, the northwestern half was transferred, as a part of Old Finland, to the autonomous Grand Duchy of Finland, created in 1809 and in a personal union with Russia. Due to its size, favorable climate, rich fishing waters and proximity to Saint Petersburg, the capital of the Russian Empire, the Karelian Isthmus became the wealthiest part of Finland once the industrial revolution had gained momentum in the 19th century. The railroads Saint Petersburg–Vyborg–Riihimäki (1870), Vyborg–Hiitola–Sortavala (1893), Saint Petersburg–Kexholm–Hiitola (1917) crossed the isthmus, contributing to its economic development. By the end of the 19th century the nearby areas along the Saint Petersburg–Vyborg section had become popular place of summer resort for wealthy Saint Petersburgers. When Finland declared its independence in 1917, the isthmus (except for the territory roughly corresponding to present-day Vsevolozhsky District and some districts of Saint Petersburg) remained Finnish, part of the Viipuri province with its center in Viipuri, the second largest Finnish city. A considerable part of the remaining area populated by Ingrian Finns seceded from Bolshevist Russia as the Finland-backed Republic of North Ingria, but was reintegrated with Russia in the end of 1920 according to the conditions of the Treaty of Tartu. In 1928–1939 parts of the isthmus which belonged to Russia constituted the Kuivaisi National District with its center in Toksova, with Finnish as the official language, according to the policy of national delimitation in the Soviet Union. However, in 1936 the entire Finnish population of the parishes of Valkeasaari, Lempaala, Vuole and Miikkulainen along the Finnish border was deported by the Soviet government. A number of defensive lines crossed the isthmus during the Soviet-Finnish hostilities in World War II, such as Mannerheim Line, VKT-line, VT-line, Main line (Finnish) and KaUR (Soviet), and fronts moved back and forth over it. In November 1939, the Soviet Union staged the Shelling of Mainila and invaded Finland in what became known as the Winter War, which took a disproportionally heavy death toll on the Red Army. 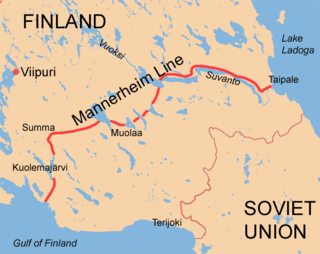 Only in February 1940 did the Soviet forces manage to penetrate the Mannerheim Line across the isthmus, the strength of which is often exaggerated. Finland ceded the Karelian Isthmus and Ladoga Karelia to the Soviet Union in the Peace of Moscow of March 12. According to the protocol appended to the Moscow Peace Treaty, the fighting was ended at noon (Leningrad time), March 13, and by March 26 the Finnish troops had been completely withdrawn. The entire Karelian population of the ceded areas of about 422 thousand people was evacuated to other parts of Finland (see Evacuation of Finnish Karelia). On March 31 most of the ceded territories were incorporated into Karelo-Finnish SSR by a decision of the Supreme Council of the Soviet Union (in the Karelian Isthmus the districts of Jääski, Kexholm and Vyborg). The districts of Kanneljärvi, Koivisto and Rautu as well as the town of Terijoki were, however, included into Leningrad Oblast. In 1941, during World War II, Germany invaded the Soviet Union in Operation Barbarossa. Few days later Continuation War as it is known in Finland (it is considered to be a front of the Great Patriotic War in the Soviet Union and Russia) started. Finland initially regained the lost territory, reaching the Russian side of the border of 1939 and seen by the Russians as indirectly contributing to the Siege of Leningrad (see Finnish reconquest of the Karelian Isthmus (1941)). Some 260,000 Karelian evacuees returned home. On 9 June 1944, strong Soviet forces opened the Vyborg Offensive and pushed the front from the pre-1939 border to Vyborg in ten days. The returned Karelians were evacuated to Finland again. In the Battle of Tali-Ihantala, 25 June–9 July, the Finns concentrated their military strength and brought the offensive to a halt at the River Vuoksi, in the northwesternmost part of the isthmus, at the closest point only 40 kilometres from the border of 1940. The Moscow Armistice ending the war was signed on September 19, 1944. The entire isthmus became Soviet, although most of it has never been captured by the Soviets in battles. This time the ceded territories of the Karelian Isthmus (including the districts of Jääski, Kexholm and Vyborg) were incorporated into Leningrad Oblast (unlike Ladoga Karelia, which remained within the Karelo-Finnish SSR). The border of the Moscow Peace Treaty (1940) was recognized by Finland again in the Peace of Paris, 1947. As a result of the war, the population of the Karelian Isthmus has been almost completely replaced. After the war the isthmus was included into the Leningrad Oblast and people from other parts of the Soviet Union, mostly Russian, were settled here. The vast majority of the old Finnish toponyms in the conquered territories were renamed to invented Russian ones by the government around 1948. The Finnish toponyms of the territories included within Karelo-Finnish SSR and of the southern part of the isthmus (albeit assimilated) mostly remained. A lot of youth summer camps were built all over the isthmus during the time of the Soviet Union. Some of them still exist. The western part of the Karelian Isthmus is an important transport corridor linking Scandinavia and Central Russia. Primorsk, terminus of the Baltic Pipeline System, which has recently become one of the most efficient Russian sea ports, is also located here. The only motorway on the isthmus is the recently completed E18 "Scandinavia" (M10) going from Saint Petersburg through Vyborg and Vaalimaa. Saimaa Canal (opened in 1856) is an important link connecting inland waterways of Finland with the Gulf of Finland. The pulp-and-paper, timber and woodworking industries (JSC Svetogorsk, pulp and paper mill in Svetogorsk, Vyborgsky Pulp and Paper Mill in Vyborg, Priozersky Furniture and Woodworking Industrial Complex and Priozersky Woodworking Factory in Priozersk, as well as other smaller enterprises all over the isthmus) are well developed in Vyborgsky and Priozersky Districts. The pulp and paper industry, however, affects the environment adversely. The predecessor of the Priozersk facilities, Priozersky Pulp and Paper Mill, a major polluter of Lake Ladoga constructed in 1931, was closed down in 1986. Northern and western parts of the isthmus are also an important reserve of granite (quarries in Kuznechnoye, as well as a number of others along the Vyborg-Hiitola railroad). Vyborg Shipyard is one of the largest shipbuilding companies in Northwestern Russia. Roskar Battery Farm in Pervomayskoye is a leading producer of chicken and eggs. In Vsevolozhsky District state-owned Morozov Plant is located, which is an important producer of paints, adhesives, abrasives and other substances. In Kuzmolovsky, Vsevolozhsky District, near the station Kapitolovo of the Saint Petersburg–Hiitola railroad, a facility of the Saint Petersburg nuclear enterprise Izotop is located, which specializes in transportation of nuclear materials and radioactive waste. Bogs of Vsevolozhsky District along the shores of Lake Ladoga and the Neva River were major sources of peat for fuel. Now it is extracted in smaller quantities, mostly for agricultural purposes. The district is also an important supplier of sand. A plant of Ford Motor Company producing Ford Focus cars was opened in Vsevolozhsk in 2002. The Karelian Isthmus is included within Leningrad Military District of the Armed Forces of the Russian Federation. The isthmus hosts airfields in Levashovo, Pribylovo and Gromovo. Other airfields in Veshchevo and Kasimovo (Vartemyagi) have been abandoned. In the northern part of Vsevolozhsky District, to the south of the old Finnish border, Karelian Fortified Region (KaUR) is located, which was reconstructed as late as in the 1960s, but now seems to be abandoned as well. There is Bobochinsky tank range (195.975 km², founded in 1913) between Kamenka and Kirillovskoye and a number of military facilities in Vsevolozhsky District in the lowlands between Lake Ladoga and Saint Petersburg-Hiitola railroad, including Rzhevsky artillery range (founded in 1879), a huge area, 740 square kilometres (286 sq mi), encircled by the Road of Life, the roads Rzhevka – Novoye Devyatkino and Novoye Devyatkino – Matoksa and the coast of Lake Ladoga (available to visitors since 2003). In 2006 a Voronezh early warning radar was built in Lekhtusi, Vsevolozhsky District. The port of Vysotsk is a base of the Baltic Fleet. 138th Guards Motor Rifle Brigade is located in Kamenka, and in the 56th District Training Centre in Sertolovo. Edith Södergran, Swedish-speaking Finnish poet. ^ Доронина А. Ю. Сосудистые растения Карельского перешейка (Ленинградская область). [Doronina A. Vascular plants of the Karelian Isthmus (Leningrad Region)] Moscow: КМК, 2007. ISBN 978-5-87317-384-6. ^ a b Davydova, Natalia N. et al. (1996). Late- and postglacial history of lakes of the Karelian Isthmus. Hydrobiologia 322.1-3, 199–204. ^ Subetto, Dmitry A. et al. (2002). Climate and environment on the Karelian Isthmus, northwestern Russia, 13000–9000 cal. yrs BP. Boreas 31.1, 1–19. ^ Saarnisto, Matti & Tuulikki Grönlund (1996). Shoreline displacement of Lake Ladoga – new data from Kilpolansaari. Hydrobiologia 322.1-3, 205–215. ^ Timofeev, V. I. et al. (2005). Evolution of the Waterways and Early Human Migrations in the North-Eastern Baltic Area. Geochronometria 24, 81–85. ^ Лебедев Г. С. Археологические памятники Ленинградской области. Ленинград: Лениздат, 1977. ^ Saksa, A. I. (2006). The Karelian Isthmus: Origins of the natural and human environment. Archaeology, Ethnology and Anthropology of Eurasia 26.2, 35–44. ^ Kurs, Ott (1994). Ingria: The broken landbridge between Estonia and Finland. GeoJournal 33.1, 107–113. ^ a b Степаков, Виктор, Евгений Балашов. В «Новых районах»: Из истории освоения Карельского перешейка, 1940–1941, 1944–1950. Saint Petersburg: Нордмедиздат, 2001. ^ Малков, Виктор (2006). Потенциал недр Archived 2007-09-28 at the Wayback Machine. Промышленно-строительное обозрение 93. The Karelian Isthmus is the name of the debut album of the Finnish band Amorphis. Wikimedia Commons has media related to Karelian Isthmus. Балашов Е. А. Карельский перешеек: Земля неизведанная. Юго-западный сектор, часть 3: Каннельярви – Куолемаярви (Победа – Пионерское). СПб. : Новое время, 1998. ISBN 5-93045-017-X. Балашов Е. А. Карельский перешеек: Земля неизведанная. Часть 2–3. Юго-западный сектор: Уусикиркко – Куолемаярви – Каннельярви (Поляны – Красная Долина – Победа). 2-е изд., перераб. и доп. СПб. : Нива, 2002. ISBN 5-86456-124-X. Priozersk (Russian: Приозе́рск, known before 1948 in Finnish as Käkisalmi is a town and the administrative center of Priozersky District in Leningrad Oblast, Russia, located at the northwestern shore of Lake Ladoga, at the estuary of the northern armlet of the Vuoksi River on the Karelian Isthmus. It is served by a station of the same name on the St. Petersburg—Khiytola railway. Population: 18,933 ; 20,506 ; 20,557 . The Vuoksi is a river running through the northernmost part of the Karelian Isthmus from Lake Saimaa in southeastern Finland to Lake Ladoga in northwestern Russia. The river enters Lake Ladoga in three branches, an older main northern branch at Priozersk (Käkisalmi), a smaller branch a few kilometres to the north of it, and a new southern branch entering 50 kilometres (31 mi) further southeast as Burnaya River, which has become the main stream in terms of water discharge. Since 1857, the old northern distributaries drain only the lower reaches of the Vuoksi basin and are not fed by Lake Saimaa. The northern and southern branches actually belong to two separate river systems, which at times get isolated from each other in dry seasons. Solovyovo, formerly Taipale, is a rural locality in Priozersky District of Leningrad Oblast, Russia, located on the western shore of Lake Ladoga on the Karelian Isthmus about 80 kilometers (50 mi) north of Saint Petersburg. The settlement is approximately 100 kilometers (62 mi) east-southeast of the post-Winter War border with Finland. Vuoksi River's southern armlet Burnaya empties into Lake Ladoga at Solovyovo. As of January 1997, its population was 7. Priozersky District is an administrative and municipal district (raion), one of the seventeen in Leningrad Oblast, Russia. It is located in the northwest of the oblast and borders with Lakhdenpokhsky District of the Republic of Karelia in the north, Vsevolozhsky District in the south, and Vyborgsky District in the west. In the east, the district is bounded by Lake Ladoga. The area of the district is 3,597.5 square kilometers (1,389.0 sq mi). Its administrative center is the town of Priozersk. Population : 43,260 (2010 Census); 42,859 ; 40,231 (1989 Census)..
Lake Sukhodolskoye is a narrow 40 km long lake on the Karelian Isthmus located in Priozersky District of Leningrad Oblast, Russia. It is a part of the Vuoksi River basin, constituting its southern armlet, and drained by Burnaya River. The Burnaya is a young rapid river in Priozersky District of Leningrad Oblast, Russia, on the Karelian Isthmus, which emerged in 1818. It flows from Lake Sukhodolskoye to Lake Ladoga and is a part of Vuoksi River drainage basin. Before the Winter War and Continuation War it was located in Finland, known under the name Taipaleenjoki. The Saint Petersburg–Hiitola railway is a 170-kilometer (110 mi) long railway with 1,520 mm broad gauge located in St. Petersburg, Leningrad Oblast and Republic of Karelia, which links Finlyandsky Rail Terminal to Khiytola through Devyatkino, Vaskelovo, Sosnovo, Priozersk and Kuznechnoye. Originally built by Finnish State Railways in the Grand Duchy of Finland, the railway was part of a trunk line from Vaasa by the Gulf of Botnia to St. Petersburg. In the 1940 Moscow Peace Treaty the territory was ceded by Finland to the Soviet Union. The railroad is now operated by the Russian Railways. The railroad is used by passenger trains between St. Petersburg and Sortavala. The track between Khiytola and Sortavala is a part of the Vyborg–Joensuu railroad completed in 1894. Vsevolozhsky District is an administrative and municipal district (raion), one of the seventeen in Leningrad Oblast, Russia. It is located in the central northwestern part of the oblast on the Karelian Isthmus and borders with Priozersky District in the north, Kirovsky District in the south, Vyborgsky District in the northwest, Nevsky, Krasnogvardeysky, Kalininsky, Vyborgsky, and Kurortny Districts of the federal city of St. Petersburg in the west, and is washed by Lake Ladoga in the east. The area of the district is 3,036.4 square kilometers (1,172.4 sq mi). Its administrative center is the town of Vsevolozhsk. Population : 153,045 (2010 Census); 131,233 ; 135,318 (1989 Census). Losevo is a rural locality in Priozersky District, Leningrad Oblast, located at the junction of Vuoksi River and Lake Sukhodolskoye on Karelian Isthmus. It is a railway station of the Saint Petersburg–Khiytola railroad. 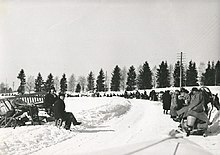 Before the Winter War and Continuation War, it was a village of the Sakkola municipality of Finland known as Kiviniemi. Lembolovo is a rural locality in Vsevolozhsky District of Leningrad Oblast, Russia, located on the Karelian Isthmus. The VT-line or Vammelsuu–Taipale line was a Finnish defensive line on the Karelian Isthmus built in 1942–1944 during the Continuation War and running from Vammelsuu on the northern shore of the Gulf of Finland through Kuuterselkä and Kivennapa and along Taipaleenjoki to Taipale on the western shore of Lake Ladoga. It crossed the Saint Petersburg–Vyborg railroad at Sahakylä and the Saint Petersburg–Hiitola railroad at Kelliö. Lake Otradnoye is a lake on Karelian Isthmus, in Priozersky District of Leningrad Oblast, south of the town of Priozersk. The area of the lake is 66 square kilometres (25 sq mi), and the area of its drainage basin is 275 square kilometres (106 sq mi).